It is considered that the United Kingdom has some of the most prestigious universities in Europe, which shape the future of many students. Here, at EDUopinions, we gather genuine information about universities all over the world and so we have compared two universities from Nottingham in England – University of Nottingham and Nottingham Trent University – both awarded for their outstanding teaching and student satisfaction. Do you want to learn more about them? University of Nottingham’s EDUopinions page contains 23 reviews left by students so far, and has a significant average rating of 4 out of 5 stars. Take a look! University of Nottingham provides a wide range of courses from Ancient History and Archeology to Veterinary Medicine and Surgery. It has over 50 courses in Arts, Engineering, Medicine and Health Sciences, Science and Social Sciences. According to the global ranking, the school is ranked in the UK and European top 30 and in the top 1% of all universities worldwide. It also has campuses in China and Malaysia, which were awarded for their sustainability and facilities. The university was founded in 1881, as a civic college, and has always attracted high profile visiting lecturers, such as Professor Albert Einstein and Mahatma Gandhi. In 1948, it was awarded the Royal Charter – formal document given by the monarch, used to establish significant organisations and universities. 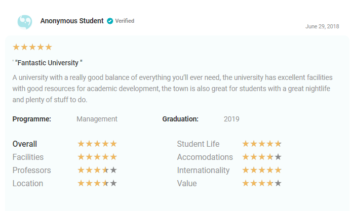 The most constant topics which appear among EDUopinions comments about University of Nottingham are about the magnificent campus and the university life. Students enthusiastically describe the grandeur of their campus, its architecture, infrastructure and great location. A great campus comes with an amazing student life too – friendly environment, with a great community which makes you feel like home! A significant number of EDUopinions users appreciated the lecturers, who manage to keep their students engaged during the courses. They are also approachable and full of knowledge. Even if most of the courses are great, some people emphasised that some of the teachers’ accents are hard to understand, thus it became difficult to follow them. Furthermore, UoN’s EDUopinions comment section also includes thoughts about the facilities provided by the university. They are plenty of social clubs, where you can find students with similar interests as yours, or sport clubs, for the ones who love to stay fit. Even if Nottingham is a relatively small city, its nightlife impresses most of the students. Undoubtedly, all the university’s comments – as previously illustrated – are positive. Another good point about University of Nottingham is related to the opportunities provided to its students as they have the chance to grow and develop themselves. Founded in 1992, Nottingham Trent University is the 13th largest university in the UK, having more than 29,000 students in 2018. The university was formed by the amalgamation of many separate institutions of higher education, which dates back in 1843. The first Chancellor, Sir Michael Parkinson, was named in 2008. The school’s strategy is to create opportunities, value ideas, enrich society, connect globally and empower people. Therefore, it is composed of three colleges, and nine schools. One can study Business, Law and Social Sciences, Technology, Art, Design, Architecture and Humanities. 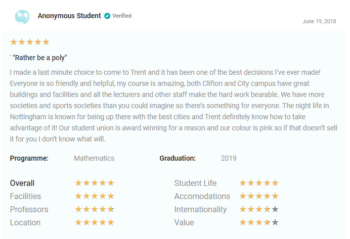 On our NTU’s EDUopinions page, you will find 12 reviews left by students about the institution, with an average rating of 4.4 starts. Check it out here. According to students’ opinions, it seems that Nottingham Trent University has earned its place in the top 30 best universities in the UK! 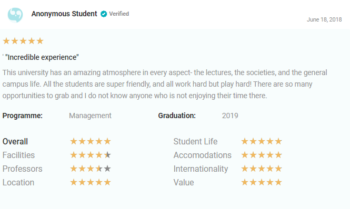 If we take a look at the most popular comments, we will find out that students are impressed by the facilities and lifestyle. The university is very modern, using the latest technology, and it has many academic resources. They are also satisfied with the great variety of extra-curriculur activities provided by the social clubs, which connects students from all over the world. Therefore, it gives you the chance to interact with different people and make friends for life! Certainly, the professors’ performance and background are also praised on EDUopinions. Students could not stop talking about their tutors’ passion, excellence, guidance and willingness to empower them to perform at their best. Without doubt, the teachers make time to help students after classes. On the other hand, there are students who are not pleased with the staff’s attitude. They believe that, sometimes, they do not act in a professional way nor offer enough support. Another two important aspects illustrated on our NTU page are related to the university’s accommodation and international environment. Admirably, most of the EDUopinions comments about Nottingham Trent University are positive. After carefully taking into consideration the students’ opinions, we can say that NTU appears to be a place where students feel safe, happy, and engaged. It creates a community where everyone can challenge themselves and learn new things. The school has definitely earned its place in the top 30 best schools in the UK! What are the main points discussed in our comparison article on University of Nottingham and Nottingham Trent University? Let’s take a look! What do you think about this article? Please let us know in a comment below! Moreover, don’t forget to share your student experience with us at eduopinions.com. We are looking forward to hearing your story! There are a wide range of scholarships, both internal and external, offered to international students. They vary according to the academic programme followed by each student – whether it is Undergraduate, Masters, or Research. Additionally, fees depend on your studies and on whether you originate from inside or outside EU. For more detailed information about that, click here. If you are thinking about obtaining a scholarship at NTU, here is everything you need to know! Keep in mind that you need to talk to a member of the admission team to find out more information about the funding options. In order to do that, complete this form and someone will contact you! Simina Stefan is a recent graduate of the Academy of Economic Studies in Romania, graduating with a Bachelor’s Degree in Business Administration. She is a cat lover and passionate about arts. She believes that getting outside your comfort zone and embracing the unknown can change your life. That is why she will live for the next six months in Egypt, working in a start-up. Her biggest dream is to become a social entrepreneur, because she truly wants to impact other people’s lives.